The objective of this study is to find the indication of sticky cost behavior in Indonesian manufacturing. The cost stickiness can be indicated by asymetric reaction of costs to changes. This study employs Anderson, Banker, Janakiraman (ABJ) model to identify the sticky cost behaviour on selling expense and general administrative expense. The samples of this study are 351 firm years of manufacturing companies listed in Indonesia Stock Exchange during 2009-2012. This study found that selling, general and administrative cost increase 0,475 percent and cost of good sold increase 1,063 percent when sales increase 1 percent. Whereas, the sales and selling, general and administrative cost decrease 0,409 percent and cost of good sold decrease 0,033 percent per1 percent decrease in sales. 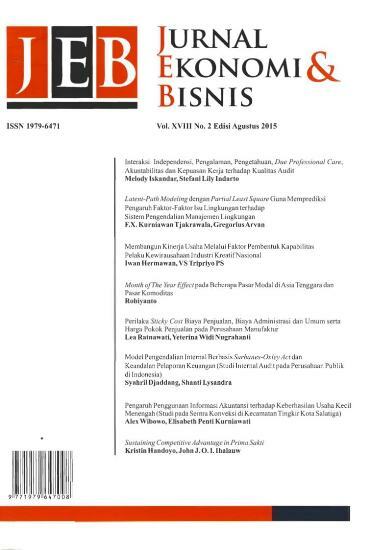 The research results provide of sticky cost behaviour indication in selling expense, general and administrative, and cost of good sold in Indonesian manufacturing company. The findings support the theory of cost adjustment delay. Anderson, M. C., R. D. Banker, dan S. N. Janakiraman. 2003. Are selling, general, and administrative cost “sticky”? Journal of Accounting Research. Vol.41 No.1. Anderson, M. C., R. D. Banker, R. Huang, dan S. N. Janakiraman. 2006. Cost behavior and fundamental analysis of selling, general & administrative costs. Management Accounting Section Meeting Paper. Argiles, J. M., dan Blandon J. G. 2009. Cost revisited: empirical application for farms. Journal of Finance and Accounting. Vol.38 No.144: 579-605. Balakrishnan, R., E. Labro, dan N. S. Soderstrom. 2011. Cost structure and sticky cost. Working paper. Available at http://ssrn.com. Banjer, R., dan L. Chen. 2006. Predicting earnings using a model of cost stickiness. The Accounting Review. No.78: 285-307.
Cooper, R., dan R. Kaplan. 1998. The Design Of Cost Management Systems: Text, Cases, And Readings. Upper Saddle River, NJ: Prentice Hall. De Medeiros, O. R., dan P. D. Z. Costa. 2004. Cost stickiness in Brazilian firm. Available at http://papers.ssrn. Hidayatullah, I. J. 2011. Analisis perilaku sticky cost dan pengaruhnya terhadap prediksi laba menggunakan model cost variability dan cost stickiness pada emiten di BEI untuk industri manufaktur. Simposium Nasional Akuntansi. Available at sna.akuntansi.unikal.ac.id. Malcom, R. E. 1991. Overhead control implications of activity costing. Accounting Horizons (December): 69-78. Melina, M. I. 1997. Penerapan metoda harga pokok proses dan analisis titik impas perusahaan kecap cap “WM” di Surabaya Jawa Timur. Skripsi. Institut Pertanian Bogor. Mulyadi. 2005. Akuntansi Biaya. Edisi ke-5 Cetakan ke-8. Yogyakarta: Aditya Media. Nugroho, P. I., dan W. Endarwati. 2013. Do the cost stickiness in the selling, general and administrative costs occur in manufacturing companies in Indonesia? Simposium Nasional Akuntansi XVI Manado. Setiawan, H. 2008. Penerapan perhitungan harga pokok produksi dalam kaitannya dengan pelaporan keuangan pada PT Alas Seni Kreasi Industri. Jurnal Ilmiah Kesatuan. Vol.1 No.10. Teruya, J., T. Shimizu, dan D. He. 2010. Sticky selling, general, and administrative cost behavior and it's changes in Japan. Global Journal of Business Research. Vol.4 No.4. Weidenmier, M. L., dan C. Subramaniam. 2003. Additional evidence on the sticky behavior of costs. Working paper. Texas Christian University. Available at http://dx.doi.org. Weiss, D. 2010. Cost behavior and analysts’ earnings forecast. The Accounting Review. Vol.85 No.4. Windyastuti, B. F. 2005. Analisis perilaku cost: Perilaku sticky cost cost pemasaran, administrasi & umum pada penjualan bersih (studi empiris perusahaan yang terdaftar di BEJ). Simposium Nasional Akuntansi VIII, Solo. Yasukata, K., dan T. Kajiwara. 2011. Are “sticky costs” the result of deliberate decision of managers?. Working paper Kobe University, Kobe, Japan.